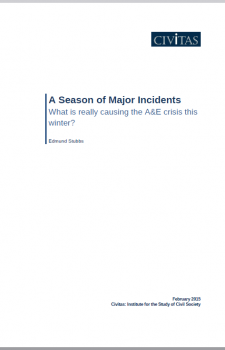 Civitas: Institute for the Study of Civil Society A Season of Major Incidents: What is really causing the A&E crisis this winter? What has caused this year’s winter crisis in A&E? Edmund Stubbs identifies 11 factors potentially contributing to emergency departments’ current poor performance. He also explores the differences between England and Wales, and whether these can be attributed to differences in leadership.